I’m back in Davis California after a couple of years away. This is the 49th annual Davis Double Century and coincidentally will be my 49th double century as well! After riding all of those doubles you would think that I would start to get good at it at some point! My only goal this year was to finish before dark but I wasn’t sure that it was in the cards. I prefer a pre-dawn start to improve my chances of finishing in the daylight. There were other early riders with the same idea so it was easy to find a small group to hook up with for the very flat first 35 miles. The first climb of the ride brings you to Monticello Dam at Lake Berryessa, built in 1953. It is just a warm up for the climbs that will follow! Rest stop #2 is located in Capell Valley on the edge of Napa wine country and I am on the leading wave of riders to arrive here. My Pegoretti Palo Santo is playing “where’s Waldo” in the bike stands. The food selection here was pretty good and I stocked up. Rest stop #3 is in Pope Valley at mile 75. There are more people here now as some of the later starting (but faster) riders are beginning to catch me. Temps have warmed to about 70 degrees! 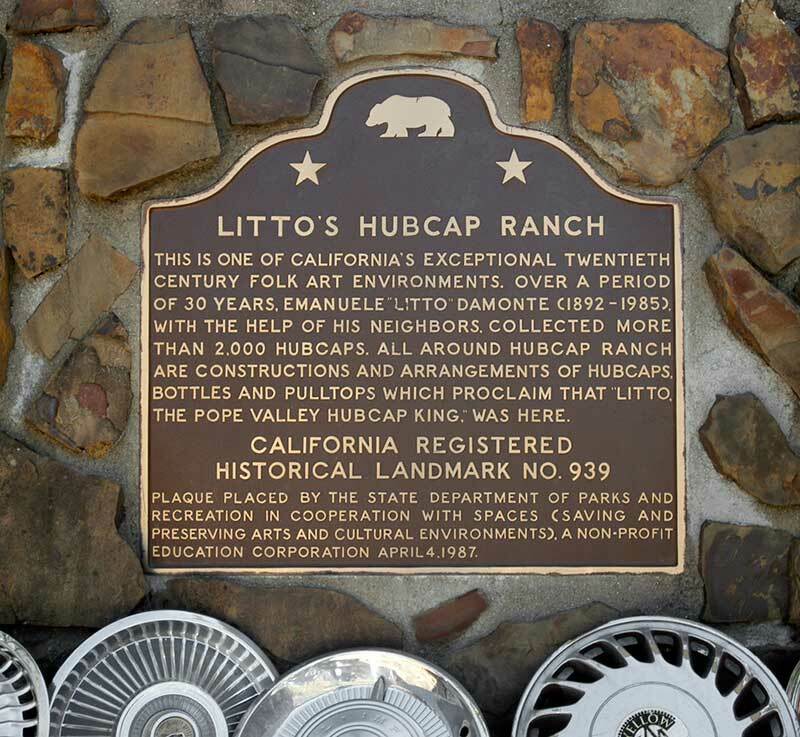 The world famous Hubcap Ranch is in Pope Valley. I have ridden by here for many years without ever really knowing the story but there is one. Good job Litto! After Pope Valley the next climb to get you in the mood is Butts Canyon. It is also not a major climb but at this point it is starting to warm up and there is no shade! Fortunately it is not a long climb and there are some breaks in the grade. So far today the winds have been light and favorable. Ms. Peggy had a better parking spot at the mile 95 stop in Middletown. This rest stop is well supplied and comes just before the biggest climb of the day up Big Canyon. In recent years Big Canyon Road has reverted back to a dirt surface for a 4 mile section. Oddly this was an improvement over the previous potholed “pavement.” This dirt section seemed to freak out many riders and they just crept along, but I ate it up! That “floaty” feeling of a loose surface is easy to get used to, just pick a good line and believe in it! This year the lunch stop at Lower Lake High School was held inside the gym. In previous years it had been outside on the grass with limited seating, but a cool spot out of the sun and at a table was a nice change! The climb up Resurrection Hill was less bad this year (grammar check?) It was not as hot and there seemed to be less traffic on Hwy 20. The rest stop there is a welcome sight since it marks the top of the last real climb of the day. There is one more small but manageable hill, but after this you know that most of the work is done! Once you turn downhill you begin to follow the course of Bear Creek, but soon it is joined by much larger Cache Creek. The key element here is that it is all downhill! That downhill ride lasts until the next rest stop at mile 157 in Guinda at the head of the Capay Valley. This is where you finally bottom out and the route from here on in is quite flat. After the Mile 175 rest stop at Forbes Ranch the shadows have gotten quite long and the wind had become a cross/headwind. It began to look like it would be a challenge to finish in daylight! With just 8 miles to go the last rest stop at Plainfield Fire Station is also the friendliest! Even though it is not far to the finish, for many riders it is just they need to get the job done. I stopped here only long enough to put my windbreaker on and check my lights. I finally finished mostly in the dark around 9pm. Sunset was at 8:30 with another 15 minutes or so of twilight. Technically I missed my goal of finishing in the daylight but it was close enough for me! My finish time this year was 16 plus hours, which makes this (my 14th Davis Double) one of my slowest. Still it is another one under my belt! Thanks again to the Davis Bike Club for hosting another successful event this year. Huge respect to you for completing your first 49 double centuries! Chapeau! Of course, we all now want to know, where and when is the magical 50th taking place?! Well,I should qualify the total a little. It is 49 doubles in the California Triple Crown series of events. I’ve done additional doubles and longer brevets including STP a couple of times, but not all of those count in the CTC series. Among that group I am a bit of an amateur really with many other riders accumulating some quite impressive totals! 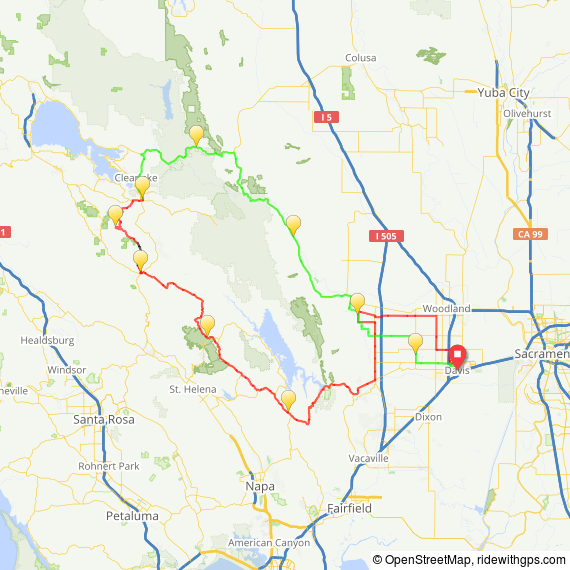 To answer your question about the next one, it will likely be the Grand Tour Double next month in southern California.